A friend who recently holidayed in Tokyo very kindly helped me to purchase four Addiction eyeshadows in 021 ME Crow, 035P Thriller, 058P Silent Scream and 061P Midnight Drive. 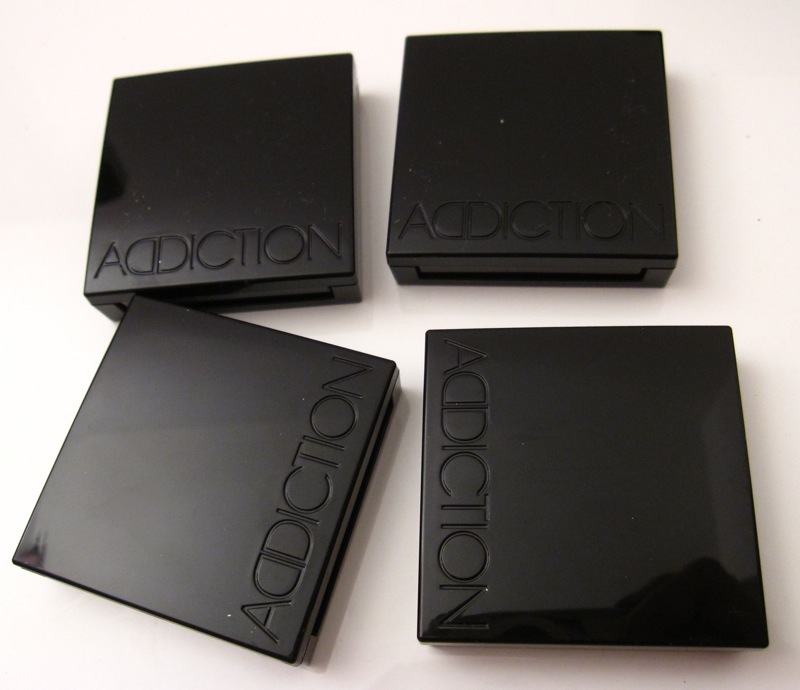 I love the sleek black plastic cases with a reflective finish. 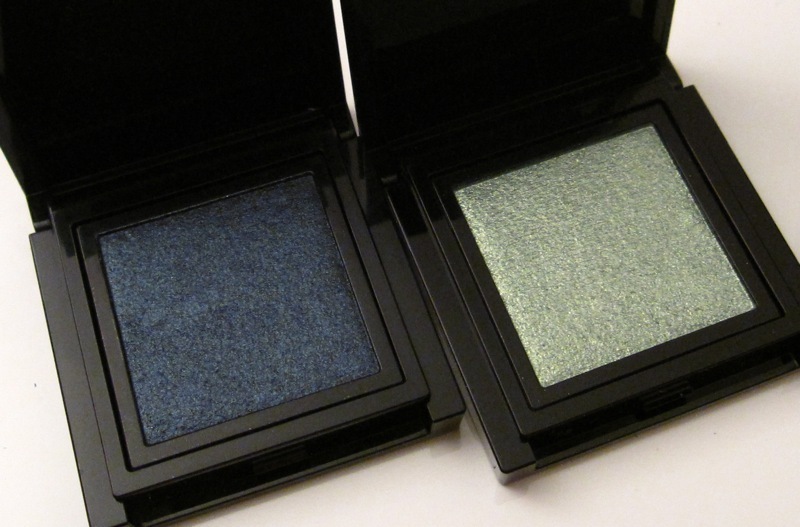 Each eyeshadow contains 1.2g of product and retails for 2100yen in Japan. These can be easily depotted by pushing a pin through the hole in the back of the case. 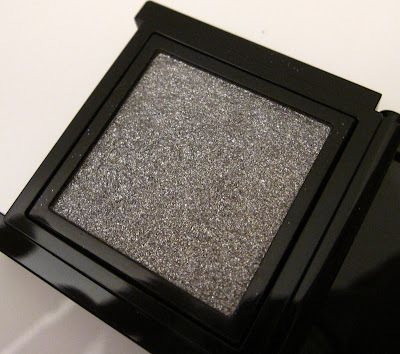 Midnight Drive, a pearlescent pale grey (like MAC Vex without the duochrome) is from the Sand Castle collection for spring 2012. This feels incredibly smooth to touch but applies quite sheer. 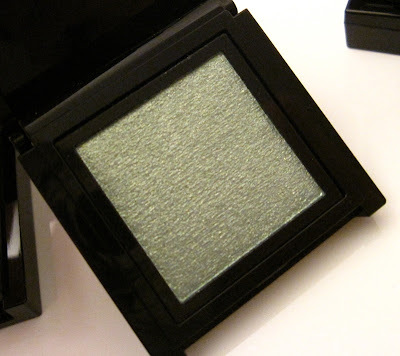 Silent Scream is a shimmery light grassy green from the Aurora Reflection collection for fall 2011. This has a nice glistening finish and good color payoff. Thriller is a charcoal grey with silver shimmer. 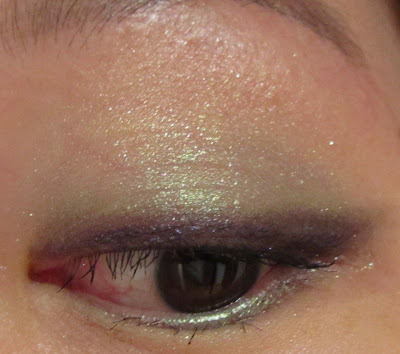 This swatches quite sheer without any primer. 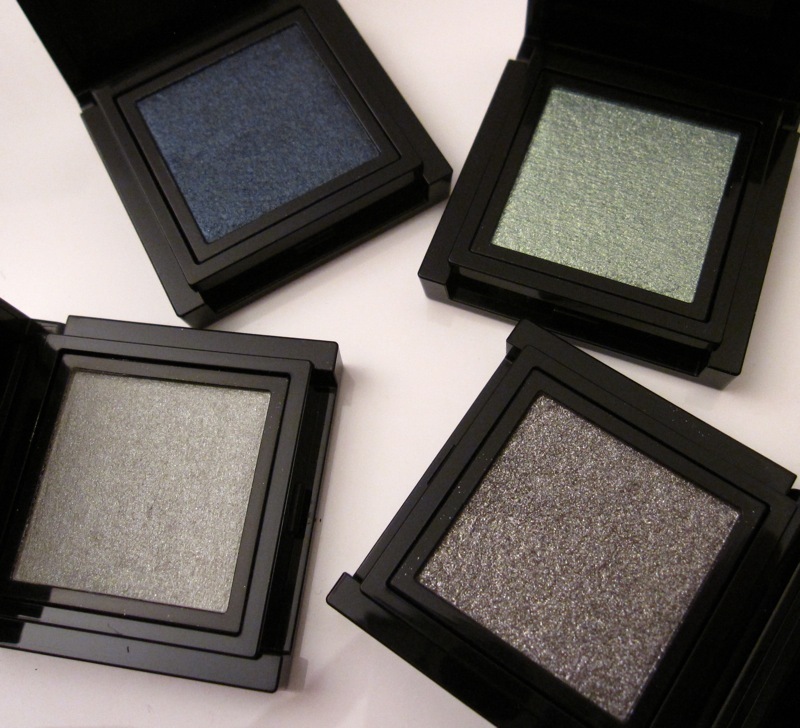 Crow is a sooty black with hints of midnight blue. 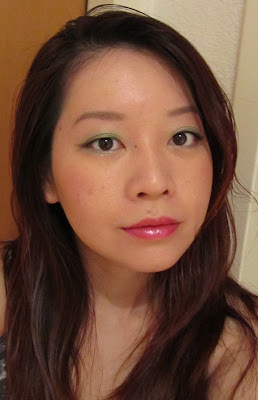 Here's the look that I did with Crow, Silent Scream and Midnight Drive. 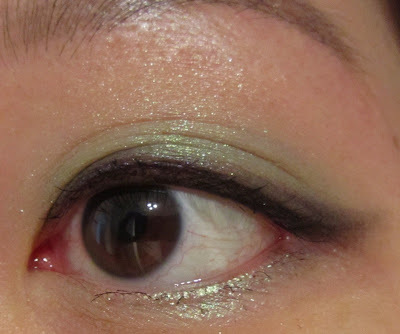 With Too Faced Shadow Insurance as the base, Silent Scream was applied from the upper lashline to the crease and along the lower lashline, Midnight Drive over the browbone area and Crow along the upper lashline. There was no creasing even after eight hours of wear. My current collection of Addiction eyeshadows and palettes - these are truly addictive! Haru these are beautiful I want to steal them all! :P I'm going to play an order for Addiction and am curious: which are your favourites? In terms of colour payoff and texture. 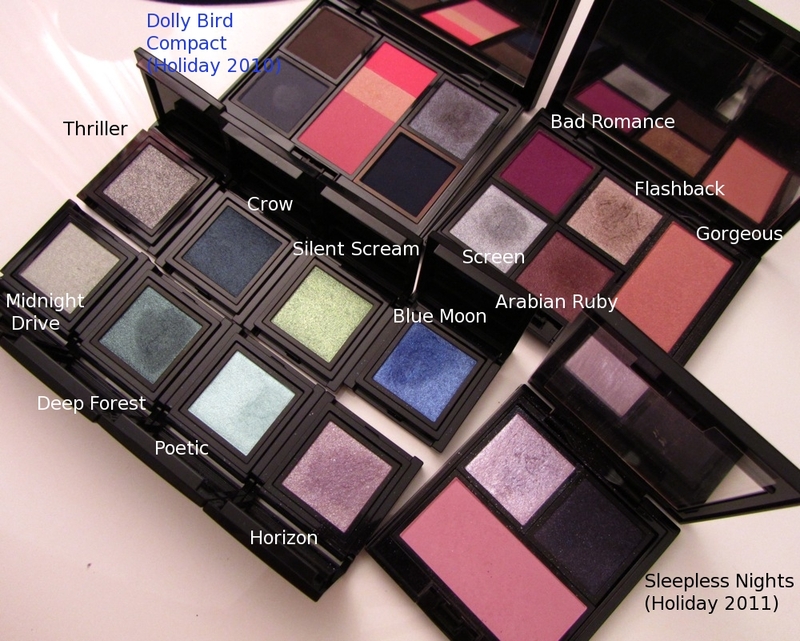 My favourites right now are Blue Moon, Deep Forest and Silent Scream. Crow is popular too but I haven't worn it yet. These aren't intensely pigmented but they do show up well over a primer and have a lovely glimmer. Do the Addiction shadows have glue on the bottom of the pans like Shu ones do? I'm curious. have you ever managed to finish all your cosmetics or you just give them away after trying? Yes, the eyeshadow pans have soft glue holding them in the case. I rarely use up my makeup items but I don't give them away except to my mother. 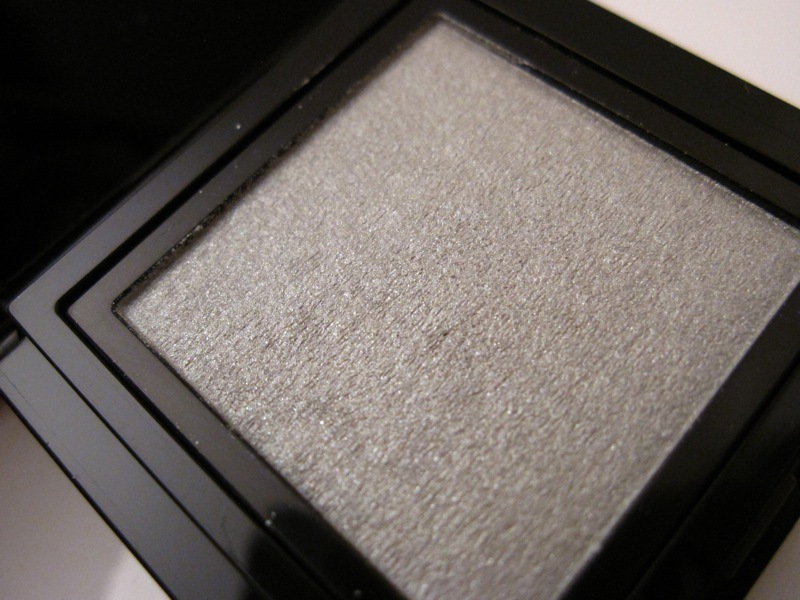 Powder eyeshadows can keep well for many years. I wear makeup almost every day so my items get used very well. Oh, darn...the glue in the Shu cases gets kinda messy when you have to reuse it...so you just use the glue to stick it into the separate multi-pan cases? Every other image I've seen of Midnight Drive shows it too be greener; is it really this grey in real life? Midnight Drive does have a pale green tone but when applied, it looks more silvery.